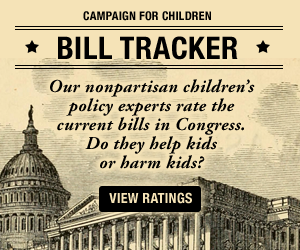 On behalf of First Focus Campaign for Children, a bipartisan children’s advocacy organization dedicated to making children and family the priority in federal budget and policy decisions, I am writing to urge you to prioritize children and working families as you lead the conference of the Tax Cuts and Jobs Act (H.R. 1.) Both the House and Senate tax bills would require drastic cuts to important programs serving children and families in response to the projected deficit increase. Even the most optimistic economic growth analysis of H.R. 1 estimates that it will increase the deficit by about $1 trillion—a staggering addition to the national debt.